As a home renovation contractor in Lafayette, our passion is wrapped in the people we serve. We value the privilege of working alongside Lafayette homeowners, learning from their wants, needs and struggles to create a home remodeling solution that captures their every need—from the homeowner’s unique personal style and functional needs to their budget constraints and project timeline. We believe in creating a home remodeling experience that is deeply rooted in values—upholding our promise to do what is right, to listen intently, observe closely and serve respectfully. Our projects, plans and processes will never trump people. Rather, we create home remodeling experiences that encourage authentic connections with our staff and crew, forging ongoing friendships with our clients that are built on trust. We integrate creative design, material selection and superior craftsmanship into a proven four-step remodeling process, specializing in the home remodeling of bathrooms, kitchens, room additions and basements. 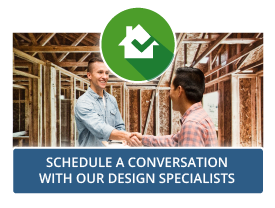 Recognizing that home remodeling projects can be fraught with anxiety, we have a unique way of carefully guiding homeowners through a process of designing and building a treasured living space that suits your needs perfectly, now and in the future—delivered on time and on budget. A team of interior and architectural designers help identify and realize the vision of your dream home and how you want to live in it. They outline every step, every detail, leaving no stone unturned, and then take responsibility for ensuring that every part of your home remodeling project is done right. Our mission is to provide the finest full service design/build remodeling experience for our clients. We do this by staying within the budget, producing the project in a timely manner and above all, doing what we promise! We are committed to making all aspects of the remodeling or building project a success. Ongoing, timely and thorough communication between the customer and our team will ensure that everyone’s expectations are met. Listening to our customer’s needs drives our daily actions. Riverside Construction’s team is comprised of professionals with many years of experience in the construction field. Their drive and passion is to transform your new home or remodeled space into something that will improve the value of your home and provide many years of enjoyment for your family. Maintaining a clean, safe work area minimizes the disruption to a family’s routine schedule when undertaking a major project. Being considerate and respectful of your family’s needs is important to us. By providing complete, accurate detailed proposals, our projects are expected to be finished on time and on budget with no surprises.